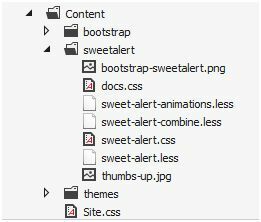 Sweet alert is a beautiful replacement for java script alert message box.It adds styles to the alert messages make alert look great.And also we can customize the alert with custom icons and custom styles etc.It is more user friendly and user experience very good.All this can be achieved by less code. The following is normal java script alert in browser. It looks normal to us.But sweet alert look like below with customizable styles. That’s why we in many of the websites to drag the user attention many of developers use this sweet alert.Now i am going to teach you how to integrate this sweet alert in out MVC application. As like previous i going to explain this in step by step manner. 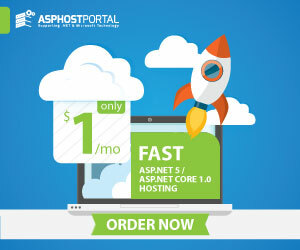 2.Goto File Menu–>New–>Project–>Select ASP.NET Webproject. 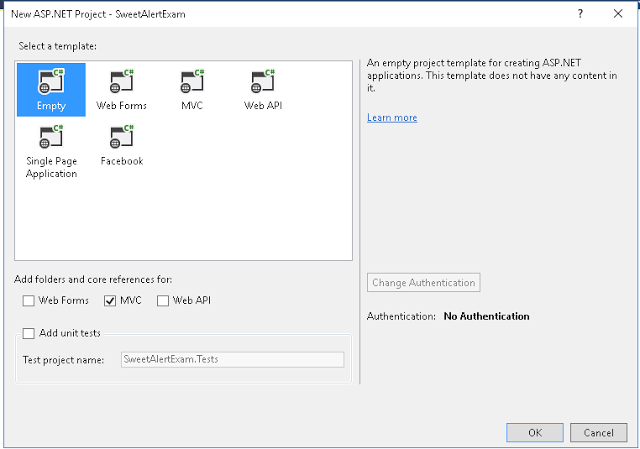 3.Give name as SweetAlertExample and click ok button. 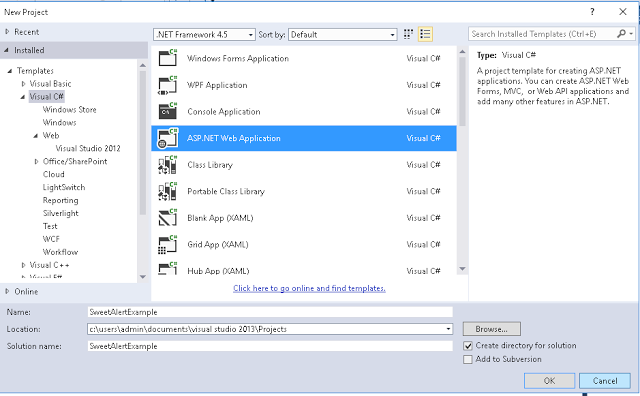 4.In after clicking on Ok button another project wizard will opened like below.Select Empty template and check the MVC checkbox to add the default folders for MVC application.And click ok to add those to project. 2.Right click on Index Action method and add Index View and click on Add. Goto Menubar–>Tools–>Nuget Package Manager–>Package Manager Console.And use following command to install Sweet alert. You can directly add folders to the solution by downlaoding from following link. 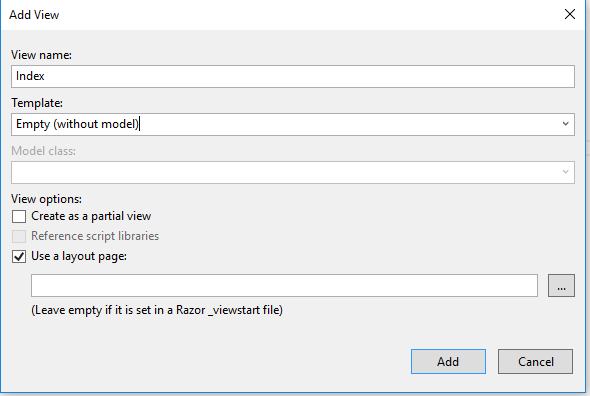 Note : Add Bootstrap to project using either nuget package manager or using CDN. 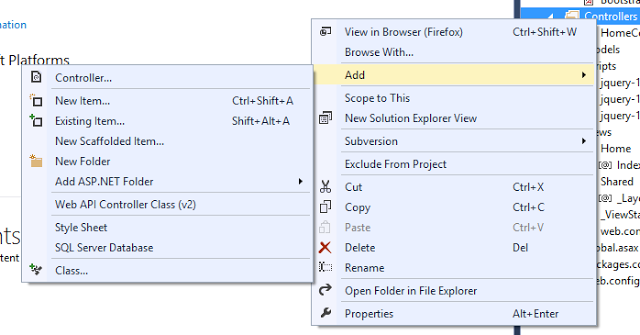 Replace Index view code with below code. showCancelButton: true, confirmButtonColor: "#DD6B55", confirmButtonText: "Yes, delete it!" Finally run the application Press F5. 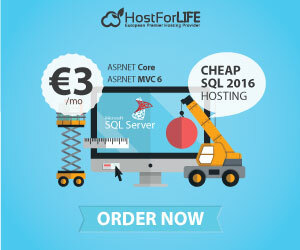 This entry was posted in ASP.NET MVC, Hosting Tutorial and tagged affordable asp.net mvc 5 shared hosting, asp.net mvc 5, asp.net mvc 5 hosting, asp.net mvc 5 hosting india, asp.net mvc 5 hosting palestina, asp.net mvc 5 hosting poland, asp.net mvc 5 hosting south africa, asp.net mvc 5 hosting turkey, ASP.NET MVC 5 sweet alert, ASP.NET MVC 5 Tutorial, asp.net mvc hosting, austria asp.net mvc 5 hosting, belgium asp.net mvc 5 hosting, cheap asp.net mvc 5, cheap asp.net mvc 5 hosting, cheap europe asp.net mvc 5 hosting, europe asp.net mvc 5 hosting, excellent asp.net mvc 5 hosting, free and best asp.net mvc 5 hosting, free and recommended asp.net mvc 5 hosting, full trust asp.net hosting, germany asp.net mvc 5 hosting, greece asp.net mvc 5 hosting, italy asp.net mvc 5, low cost asp.net mvc 5 hosting, most recommended asp.net hosting, netherland asp.net mvc 5 hosting, optimum asp.net mvc 5 hosting, powerfull asp.net mvc 5 hosting, recommended windows asp.net hosting, reliable asp.net mvc 5 hosting, reliable free asp.net mvc 5 hosting, secure windows hosting, spain asp.net mvc 5 hosting, sweden asp.net mvc 5 hosting, sweet alert tutorial, top asp.net mvc 5 hosting, uk asp.net mvc 5 hosting, unlimited free windows hosting. Bookmark the permalink.